Resource > 4K Media > HDR VS SDR: What You Should Know? 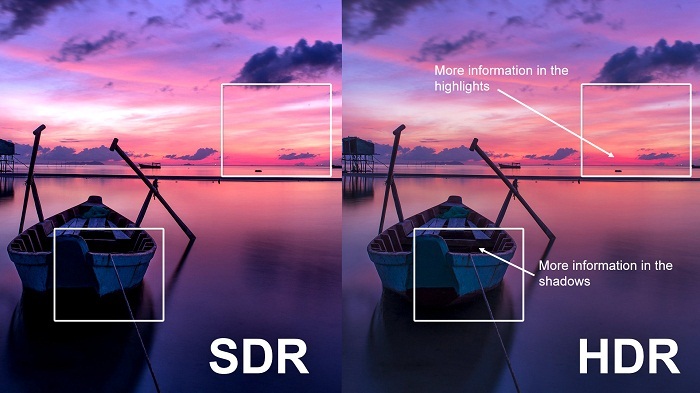 Summary: What are the differences between HDR and SDR? Here in this article, we will compare HDR and SDR and show you a tool to convert the HDR of 4K Ultra HD Blu-rays to SDR. It doesn't mean that you have a 4K TV you'll enjoy the fullest 4K quality. This is because there are two types of 4K Video - SDR and HDR. The similarity between the two is that they have 4000 lines of resolution. Although both have the same number of horizontal resolution, their picture quality differs, however. Before we proceed, let's examine what SDR and HDR mean and their main characteristics. HDR means High Dynamic Range. HDR has been used in still photography before making its shift to TVs, smartphones and computer monitors, among others. HDR promises a comprehensive color range, and picture quality that resemble what's seen by the naked eye. As a result you get increased overall image detail SDR doesn't promise these advantages. To appreciate the importance of HDR, it's important to understand that images aren't captured as the eye sees them. Images captured will be darker or brighter than what's visible to the eyes. If an image is overexposed, the appropriate color info on the brighter parts is lost. Similarly when an image is underexposed, true color info on the darker parts are lost. When HDR is applied to such images it calculates the amount of light in the image and the lost color information is restored. Thus we get realistic images with enhanced detail and depth. The popular HDR standards are HDR 10 (introduced in 2015 and widely used), HDR10+ introduced in 2017, Dolby Vision (supports 12 bit color depth) and HLG (Hybrid Log-Gamma), also known as broadcast HDR. SDR means Standard Dynamic Range. It’s the video standard you would have come across over your non-4K HDTV or cinema. Although there are some high-end SDR television sets that displays excellent image quality they are no match for the contrast ratio that HDR offers. High-end SDR however comes close to low-end HDRs with no noticeable difference in image resolution. Now that you know the main differences between HDR and SDR, you can now prepare videos according to the 4K format that your television supports. One of the best ways to watch UHD movies over your 4K UHD TV is by subscribing to Netflix’s 4K UHD movies over Netflix. But then if you already have 4k UHD Blu-rays lying around in your house, you don’t have splash out cash subscribing to the Netflix premium plan. The 64-bit version of DVDFab contains a UHD Ripper which is capable of ripping 4K Ultra HD Blu-rays to a 4K format to enable you to watch a movie on your 4K computer monitor or 4K UHD TV without the need for playback over a 4K Blu-ray player. DVDFab UHD Ripper does this by ripping an unprotected 4K Ultra HD Blu-ray movie and allowing you to use 6 different conversion profiles according to what your software media player or 4K TV could handle. If you need lossless quality that's no different from the UHD Blu-ray you're ripping, you'll have to opt for MKV Passthrough or M2TS Passthrough. If file size is a concern and you can do with medium quality opt for MKV.4K.H265.10bit or M2TS.4K.H265.10bit. If you want to shrink your UHD Blu-ray movie further then go for MP4.SDR or MKV.SDR. Despite heavy compression, these two profiles will allow your video to maintain natural color, brightness and sharpness, among others. That said, here’s how to enjoy HDR10 video quality even if your TV doesn't support it. While HDR10 is the dream viewing experience of most movie fans, their television sets might not support it. If you would still like to enjoy quality close to HDR10, then DVDFab UHD Ripper can do the job for you by converting HDR video to SDR with no noticeable quality loss. All this is fine, but you may be concerned about the duration of the ripping and conversion process given the mammoth size of 4K Ultra HD Blu-ray content. But you don't have to lose sleep over this matter thinking you'll need to dozens of hours to wait before ripping and conversion are complete, especially of you don't own a top-end computer. The 4K Hardware Acceleration feature that comes with the program ensures that you save precious time on the ripping and conversion process. Need the job to be done within an hour? Put the latest hardware technology to use. Upgrade your computer with a video card capable of supporting 4K HEVC 10-bit decoding and encoding. To that end, you could check out NVIDIA’s GeForce GTX 1050 Series or higher and may even want to take a look at Intel’s Kaby Lake processor series or higher. Now that you’ve learned enough about the capability of DVDFab UHD Ripper, why don’t you give it a try by downloading it for free today and undertake HDR to SDR conversion painlessly? 4K UHD Blu-ray movies can give you an immersive viewing experience. So here we list top 10 best 4K UHD Blu-ray movies as of 2019 for you to enjoy at your leisure time. How to convert 4K Ultra HD Blu-rays to MKV? Here we recommend you a powerful 4K Ultra HD Blu-ray ripper and show you how to convert 4K Ultra HD Blu-rays to MKV easily and quickly.